Burberry Weekend For Man EDT is a sweeter, green and fresh fragrance. 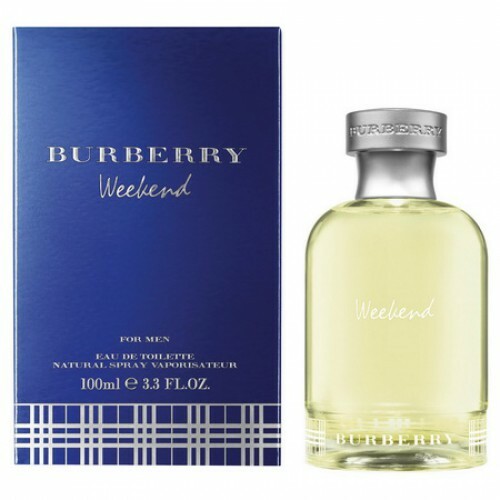 Burberry Weekend For Man EDT 100ml. - Burberrys design house launched Burberry Weekend in 1997, it is found to be a sharp, mossy, woody fragrance. Burberrys unique blends of crisp woods and citrus give it a very masculine scent. It is suggested for casual wear. Breathe in the scent of Burberry Weekend for men you will have an endless sandy beaches, full of warm summer sun and fresh air charge with wandering. Inhale again, and you want to indulge in a love affair, or take a lot of bold and reckless behavior. Harmonious taste like the very nature calls, and directed to be natural, to enjoy life, to love and to be happy. Character: Fresh, clean, fabulous, fascinating, transparent fragrance family: floral-fruity Top notes: mandarin, sage, Reseda heart note: red cyclamen, blue hyacinth, wild rose, peach blossom, orris, nectarines Note final: Cedar, Santana Moss Year: 1997. It is recognized spirits, which appeared in 2000, he was the first fragrance in the composition of which has been used so many aldehydes, which give it a unique sparkling character. It was the first abstract fragrance in the history of perfumery. Aroma plays notes of sandalwood, rose, jasmine, amber, ylang-ylang, iris, patchouli, vetiver and neroli. Together with Burberry Weekend For Men man goes to extraordinary journey through the picturesque English countryside, where you can catch a measured way of her life. The subtlety and elegance of the atmosphere, which emphasizes a note of fresh bergamot and grapefruit. Fragrance watermelon presents an extraordinary life in those places. Warm chord sandala meda and hints at a cozy atmosphere near the fireplace. Weekend for Men reflects modern simplicity and informality. If you use perfume arises an incredible sense of freedom and flight. A few drops will change the representation of the owner to make city life and see things in a new light.